My second session was very well visited, so I can only say thank you people for attending. During presentation, there were huge number of questions regarding new Windows 8 OS. People are interesting in upcomming Windows OS and also how will impact on development of desktop applications. From this link you can download my presentation slides. Thanks Microsoft for great organisation on MSNetwork 2, thank you all for attending. Demos can be downloaded here. The presentation slides can be download here. 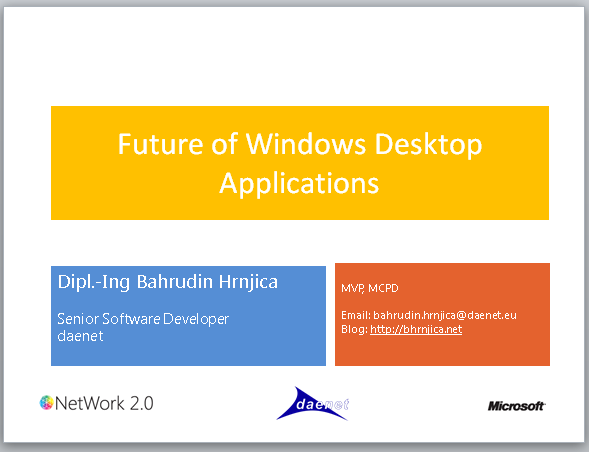 I will be speaking on the Croatian Microsoft conference so called WinDays. My session will be at 25. April starting at 9:30 on Dvorana 8. More about presentation can be found here. Beside Windows Phone 7 it will also be presented how to develop the same application on Windows 8 and Metro Style app. More information about WPWIdgetLibrary can be found on one of my previous posts on this blog.